Eating on the Mountain lets you have a true taste northern Michigan – our chefs incorporate fresh, local ingredients into every dish. And just because you’re on vacation doesn’t mean you have to ruin your diet. Ask our servers about the Peak Performance menu for healthy, leaner portion sizes. Open year round for lunch and dinner daily. Serving breakfast beginning March 21 for a limited time only! 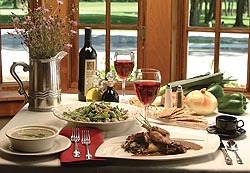 The Thistle Pub & Grille offers a unique menu that changes from season to season. Savor our steaks, fish, king-sized salads, or try one of our weekly features. Our Peak Performance menu offers an assortment of great tasting items for a healthier balanced life. Full children’s menu available too. Located in Kinlochen. Thirsty? The Thistle Pub & Grille has that covered too. From a wide array of international and locally brewed craft beers on draft to several single-malt scotches, your thirst will inevitably be quenched. Our Farm-to-Table dining series brings the fresh flavors of northern Michigan to the Thistle Pub & Grille the third weekend of each month, May through September. The Crystal Mountain culinary team works with local farms, making personal visits to many of them, to build a custom three-course menu. Beginning March 21, breakfast will be served at the Thistle Pub and Grille. For a current list of hours view our This Week At Crystal pamphlet, or call our Dining Hotline at 888.968.7686 ext. 6040. Sample a variety of your favorite appetizers, entrées, and desserts! Kid and family friendly options. Located in the lower level of the Lodge. Enjoy a beer, wine or a mixed drink at the adjoining Wild Tomato Bar, now with three flat-screen TVs. Open select evenings.